A Classic Tuna Melt is one of our favorite lunch recipes ever. 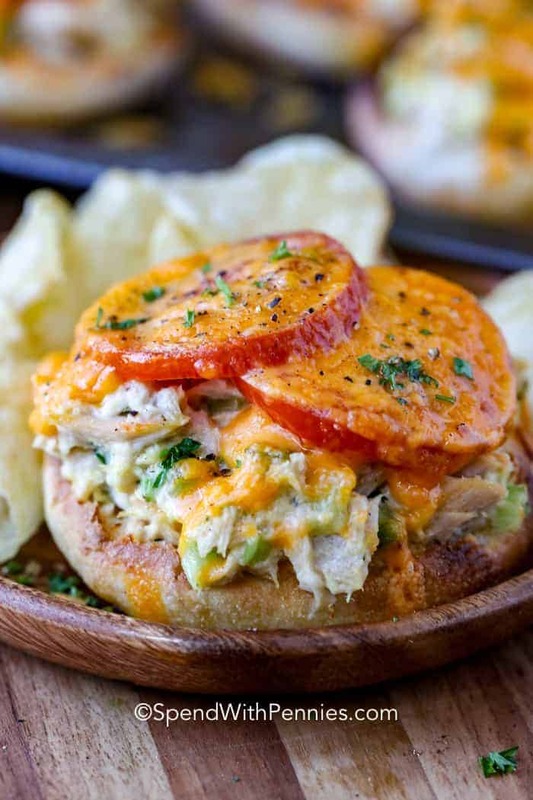 A tuna melt is a warm, open-faced sandwich made with tuna salad and topped with tomato and melted cheese. The central ingredient is canned tuna — aka “tuna fish”. There are some who think the best tuna melt recipes absolutely must be made with American cheese and toasted white bread. (The way many moms used to do.) 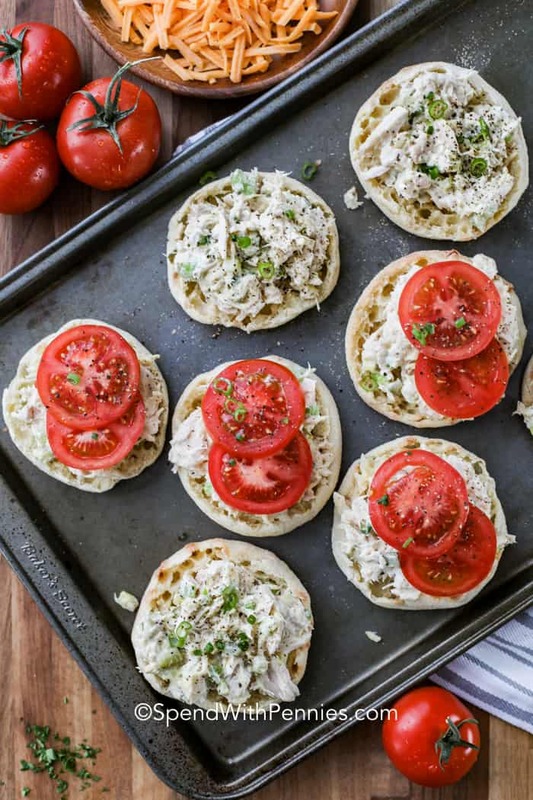 But I use an English muffin in my tuna melt recipe, because it holds up well and any juices seep in to the little holes for more yum. I think you’ll agree, cheddar makes for a really tasty sandwich. A little dash of Dijon mustard and lemon juice in the tuna salad also adds some zest to this recipe. To make the best tuna melt recipe, start by preparing a tuna fish salad! Simply mix the ingredients together (this part can be done ahead of time but if it’s cold from the fridge, it may take longer to bake). We’ve always had tuna melts as an open faced sandwich (with no top bread) but you can do it either way. It’s personal preference. As kids, we’d have this over leftover hot dog or hamburger buns so really, any bread is great with this! English muffins hold up so well to the heavier toppings. Place the English muffin halves on a cookie sheet and toast until lightly browned. 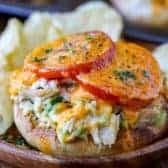 Place scoops of tuna salad on each muffin half, and top each with a slice of tomato (if desired) and a couple of cheddar slices. Bake in the oven until the cheese is melted and gooey, and serve. Tuna melt is pretty much a complete meal in itself. A spear of dill pickle and a handful of potato chips are pretty much all you need on the side. Or, if you want to dress up your plate a bit — say if you’re fixing tuna melt sandwiches for company — then consider a side of carrot salad with raisins, to offset the saltiness of the tuna and cheese. This simple, tasty sandwich always sparks memories of mom’s home cooking, and maybe that’s why “tuna melts my heart.” I hope it melts yours too! American Classic: Tuna fish salad, Wonder white bread, American cheese or Velveeta, fresh tomato. NY Deli: Tuna salad, pumpernickel bagels, dill pickle slabs, NY cheddar. Apple Pie: Tuna salad mixed with chopped pecans & dried currants, fresh apple slices, brioche hamburger rolls, extra sharp cheddar cheese. Hot and Spicy: Tuna salad, canned jalapeno slices, soft wheat taco shells, roasted red pepper (canned or from a jar), pepper jack cheese. Californian: Tuna salad, avocado slices, slivered almonds, asiago cheese, whole grain bread. Ham Salad – Great for leftover baked ham! BLT Avocado Egg Salad – Family favorite! Shrimp Salad – Use a shrimp ring to make it easy! 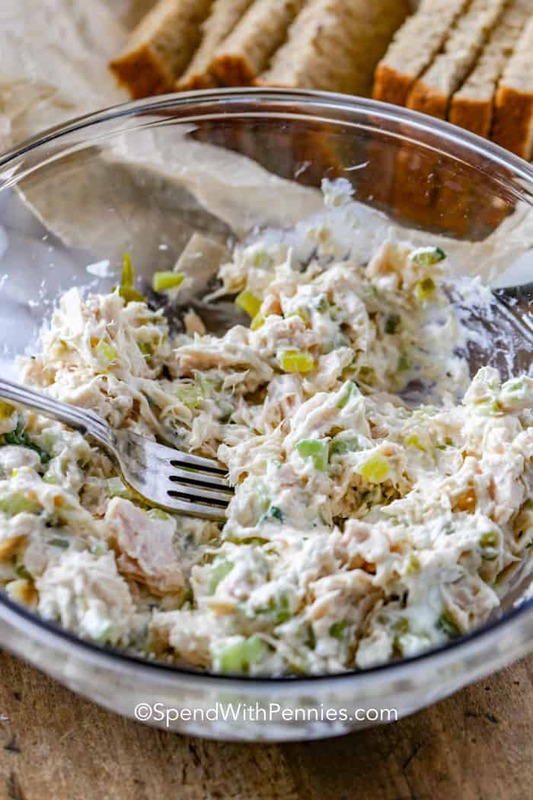 The BEST Chicken Salad – The perfect chicken salad recipe. A classic tuna melt is one of our favorite lunch recipes! This can be made on any type of bread for an easy meal! Combine tuna salad ingredients in a small bowl and mix well. 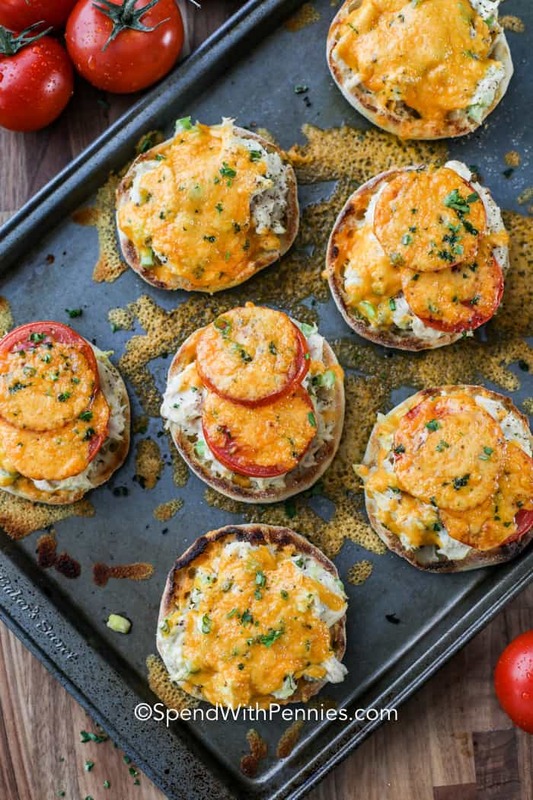 Place the English muffin halves on a baking sheet and broil 2-3 minutes or until they start to brown. Remove from the oven. 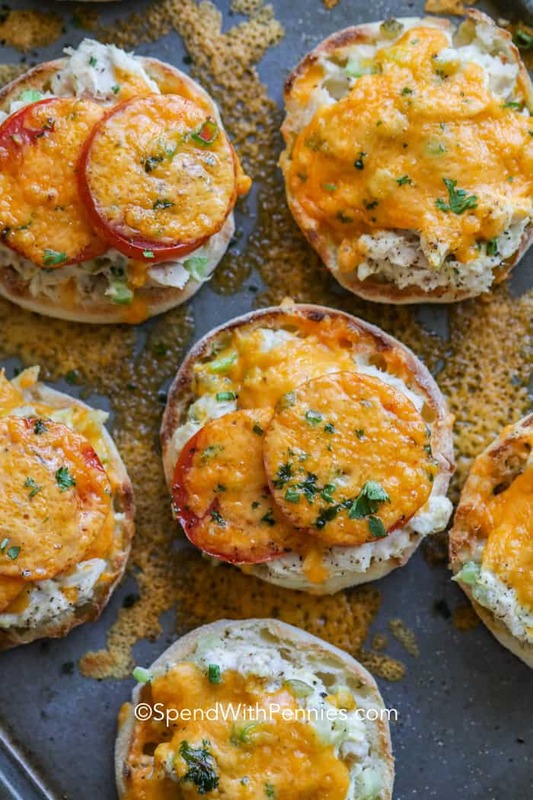 Divide the tuna mixture over the English muffins.Top with tomato slices and cheddar cheese. 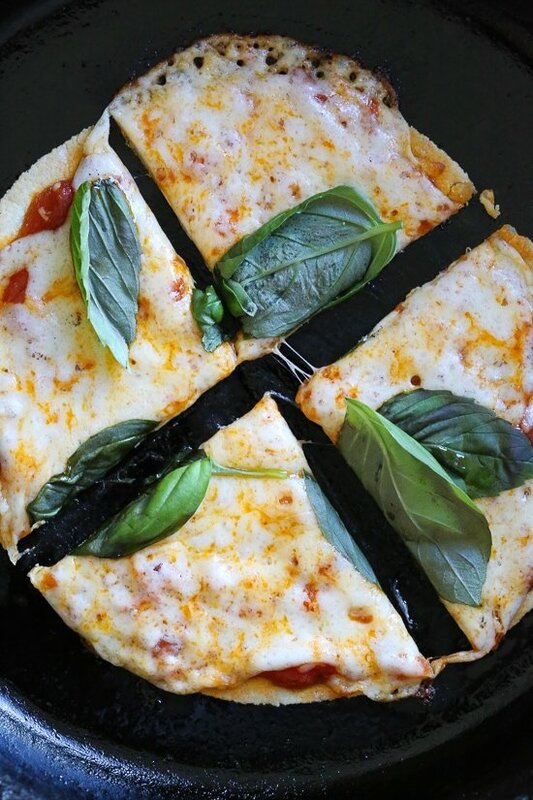 Bake 10-15 minutes or until cheese is melted. Broil 1 minute if desired. Avocado Egg Salad is a delicious twist on a traditional egg salad with the addition of rich creamy avocado. 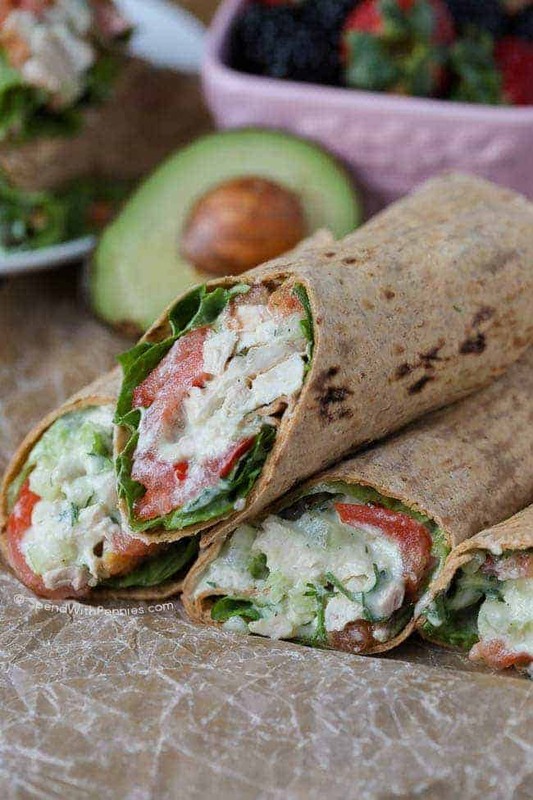 To take this wrap from ordinary to extraordinary, it’s topped with fresh lettuce, ripe juicy tomatoes and crisp smoky bacon. I absolutely love an effortless meal, especially towards the end of summer when I’d much rather be outdoors than in the kitchen over a hot stove! I am excited to have partnered with Flatout to bring you this Avocado Egg Salad; a delicious twist on a family favorite! Bacon, lettuce, tomato, avocado and of course egg all smothered in a creamy avocado dressing to create a salad that is truly unique! I love everything avocado or avocado inspired (including Avocado Deviled Eggs). Bacon? Can’t live without it! Lettuce? A crisp necessity for any sandwich. 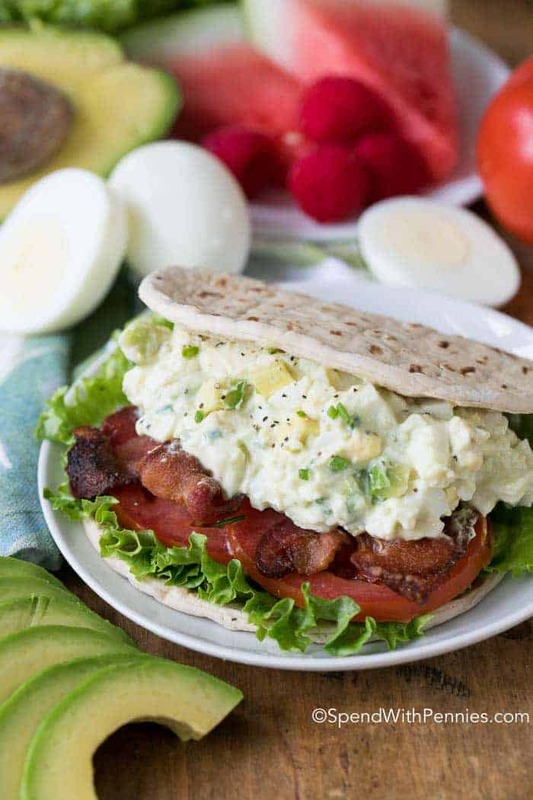 So, it’s not a surprise that these three fantastic foods have found their way together to accompany creamy egg salad in this BLT Avocado Egg Salad! Egg Salad has been around for centuries. It is suggested that it made its first appearance in the mid 18th century. Eggs, being the least expensive protein, were a solid staple in most homes. 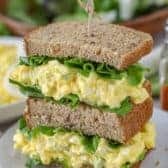 To this day eggs remain a convenient, inexpensive protein option, which is why egg salad and egg salad sandwiches are still so popular. Fast forward to this moment, when inspiration takes flight and a new twist on this old favorite is born. 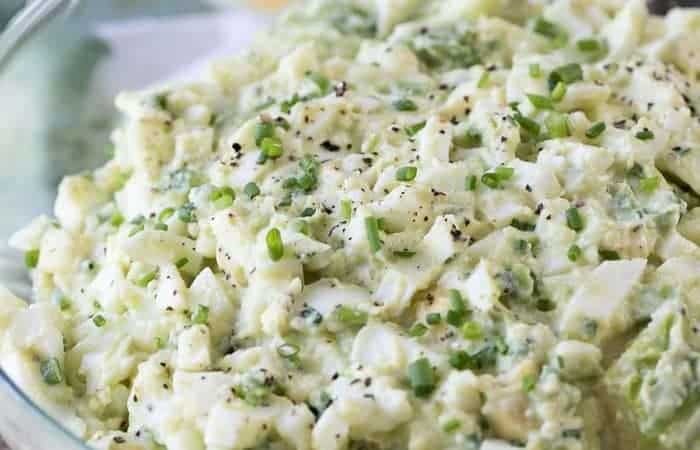 I have combined all the key ingredients of a traditional egg salad; egg, mayonnaise, garlic and chives, and simply added in some extra creamy rich flavor with both mashed and cubed avocados! What would encase this glorious mountain of sandwich fillings? Flatout Foldit® Flatbread of course! It encases all the yummy goodness in a delicious hand held bite. Of course any good egg salad starts with perfectly hard boiled eggs. It’s very simple to make perfect eggs if you know how. While they’re great for egg salad, they’re perfect for snacks on the go or to slice up on a piece of toast too! I make fail-proof (and easy to peel) hard boiled eggs on the stove top. If you have an Instant Pot, check here for Instant Pot Hard Boiled eggs which are the easiest peeling eggs ever! 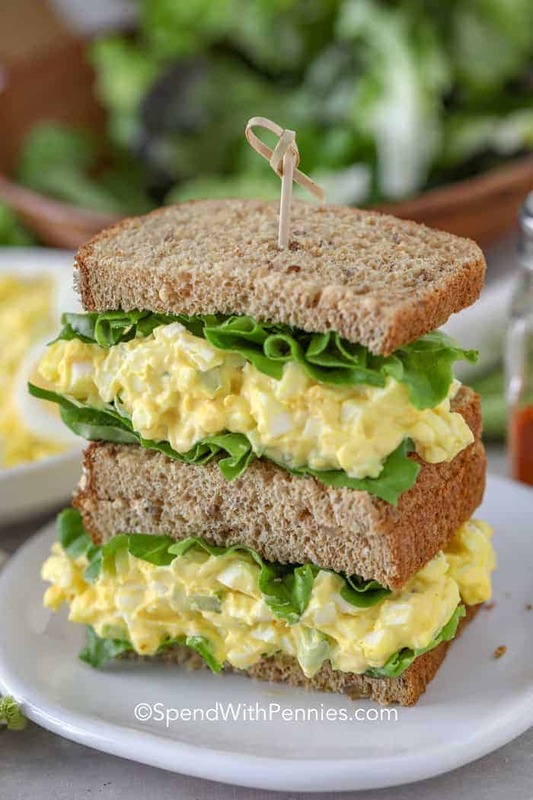 This Avocado Egg Salad sandwich is a perfect solution for taking on sweet summer picnics, a complete and satisfying sandwich to take on your next road trip, or as a simple and delicious lunch or even dinner on a hot summer day! It is so fresh, crisp and filling and the best part is how easy it is to make! You will have loads of extra time to soak up the sun or just relax in your backyard with a glass of my Easy Homemade Strawberry Lemonade! If you do not have bacon, simply omit it. Or a slice of ham would accompany this sandwich nicely in place of the bacon. Not a fan of tomatoes? Try chopped roasted red peppers. So delicious! Replace the mayonnaise with your favorite ranch or blue cheese dressing for an extra punch of flavor! Replace the Foldit with a Flatout Flatbread for a perfectly portable wrap! Ham Salad – Great for leftovers! Classic Tuna Salad – The perfect tuna fish sandwich! My Favorite Reuben Sandwich – Deli classic! Easy Tuna Melts – Great to feed a crowd! The BEST Chicken Salad – Easy make ahead meal! Mash 1/2 of the avocado with 2 teaspoons of lemon juice. Add egg yolks, mayonnaise, garlic powder, salt, pepper and chives. Combine until smooth. Chop egg whites. Dice remaining 1/2 of the avocado. Stir egg whites and avocado into the egg yolk mixture. 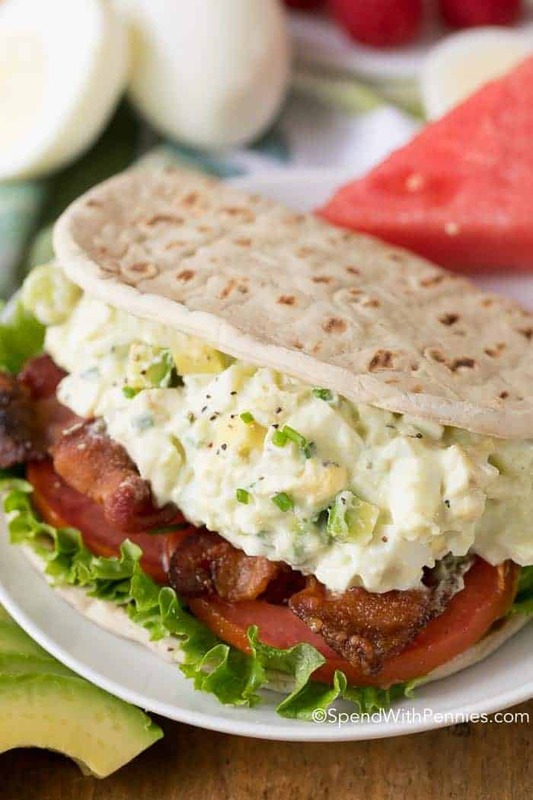 Top each flatbread with lettuce, tomato slices, 2 slices of bacon and the avocado egg salad mixture. I am excited to have partnered with Flatout® to bring you this yummy summer recipe. Working with great brands I love allows me to keep bringing you the great recipes you love! While I was compensated for this post, all thoughts and opinions are my own. The Best Egg Salad Recipe is an easy favorite! 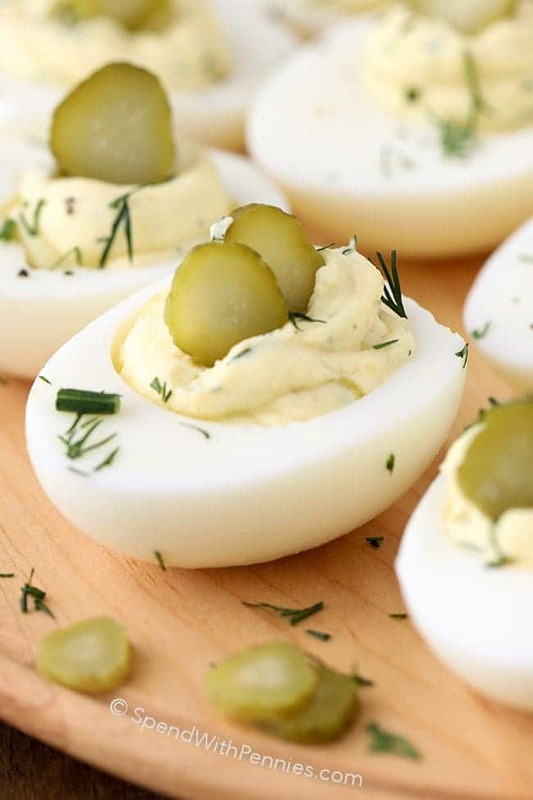 Nothing is more picnic perfect than hard boiled eggs mixed with mayo and a pinch of mustard and of course crunchy with celery and green onions! 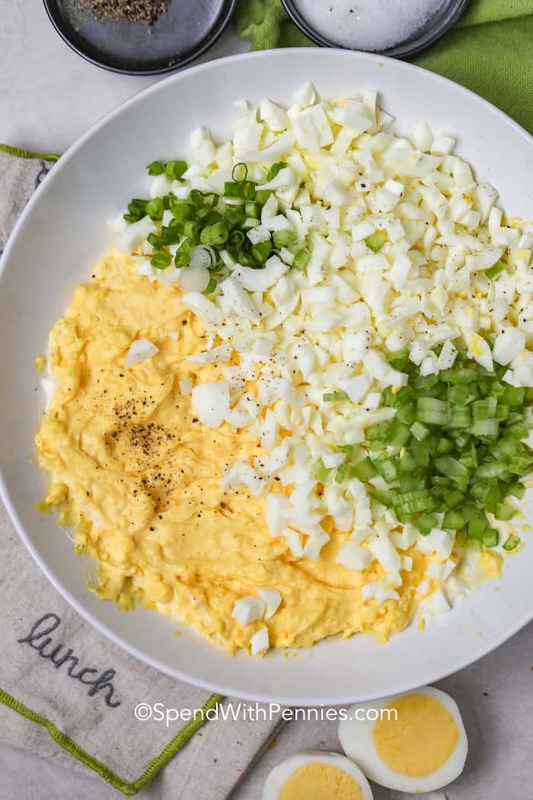 Whether you make an egg salad sandwich or a healthy egg salad using lettuce or low carb wraps, nothing says ‘all American’ like and egg salad! I use this method for perfect hard boiled eggs every time. They come out with tender cooked whites and creamy yellow middles (without a grey ring). I bring them to a boil and then remove from the heat and let sit covered for 15-17 minutes (large eggs). Run under cold water and peel one to make sure it’s perfect. Are Your Eggs Fresh? 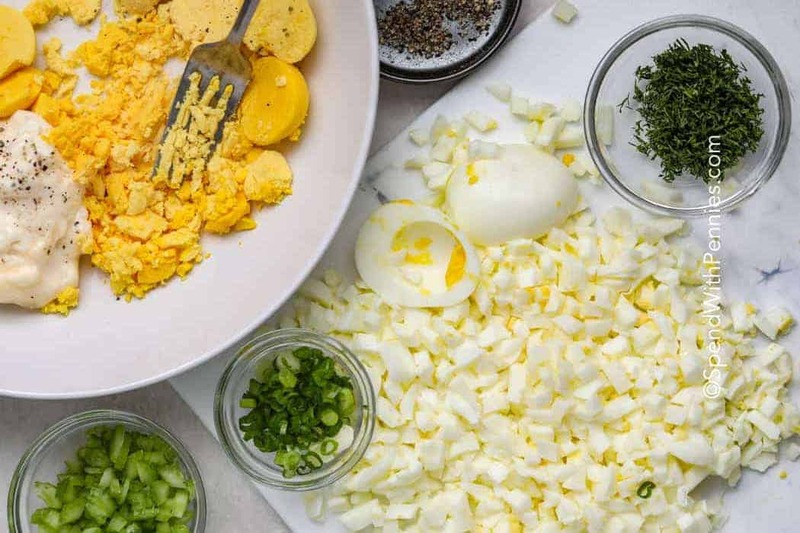 The best egg salad recipe begins with great ingredients. Fresh eggs will cook better and look brighter. A fresh egg will lay on its side on the bottom of a bowlful of water, if they are a little older, they’ll still sink, but stay on one end. Don’t eat eggs if they float on the surface of the water, this means they’ve expired. Be sure to finely dice the onion and celery so the pieces are smaller than the egg pieces! Mash the yolks with mayonnaise until completely smooth and then fold in the whites. This makes for the best egg salad, it comes out so creamy! I use an egg slicer to chop the whites placing the white in the slicer, cut and then turn the egg and placing it through again. Make the chopping really quick! I use my egg slicer for other things too like strawberries, kiwi and it’s especially great for cutting mushrooms to make chicken marsala. Boil, cool and peel the eggs. Cut in half, remove the yolks and chop whites. Mash the egg yolks with the mayonnaise, mustard and salt and pepper to taste. Add the chopped egg whites and the green onion, celery, the chopped fresh dill. Blend carefully and serve cold on bread, a salad, or a wrap! For a fresh take, try making an avocado egg salad with mashed avocado! 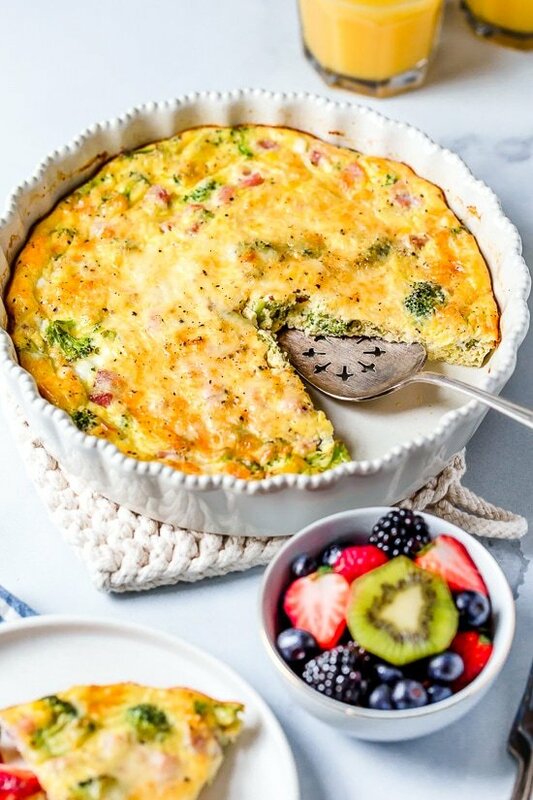 Super healthy take on an American classic! You mean if there’s any leftovers? It’s pretty easy to tell when egg salad is ready to be tossed. It will get watery and lose its bright color! 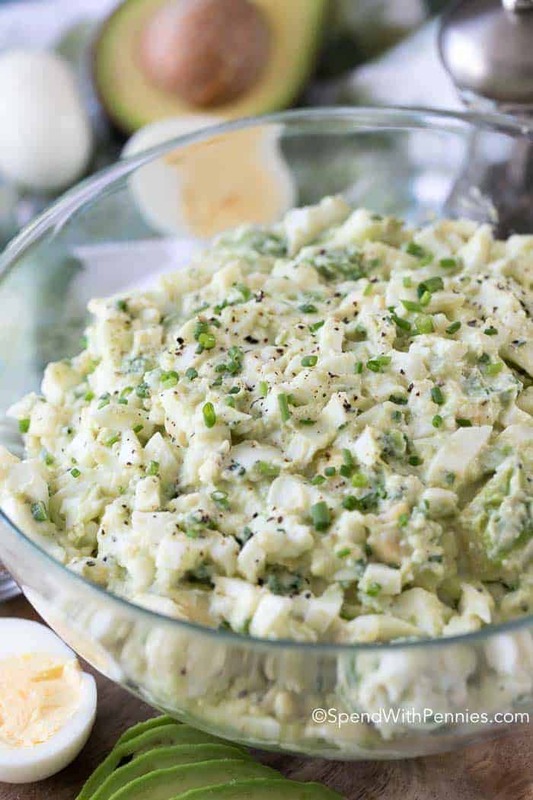 But chances are, this egg salad recipe won’t last too long in your house! 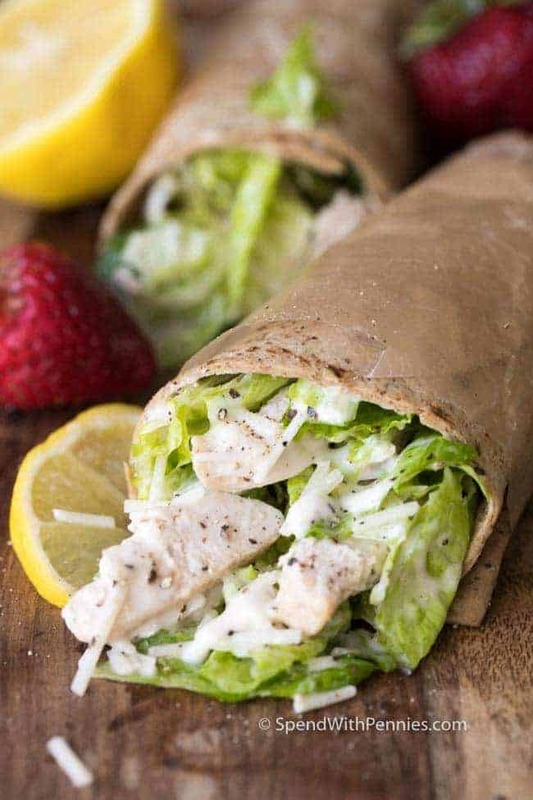 The BEST Chicken Salad – the best sandwiches! Waldorf Salad – Fresh and crunchy! Classic Tuna Salad – Easy recipe great over lettuce or on bread! 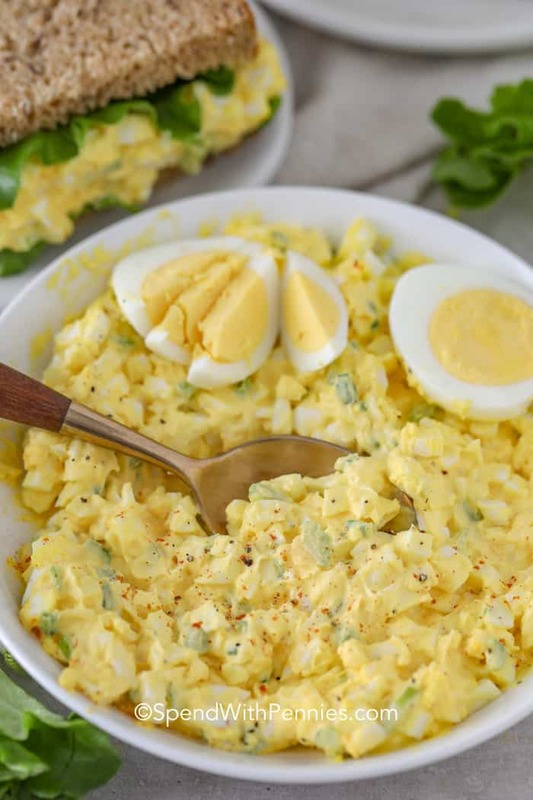 Nothing is more picnic perfect than a creamy egg salad recipe! Cut eggs in half. Remove yolks and chop whites. Mash yolks with mayonnaise, mustard and salt & pepper to taste until smooth and creamy. Serve on bread or over lettuce. Fried Cabbage is one of my favorite side dish recipes. 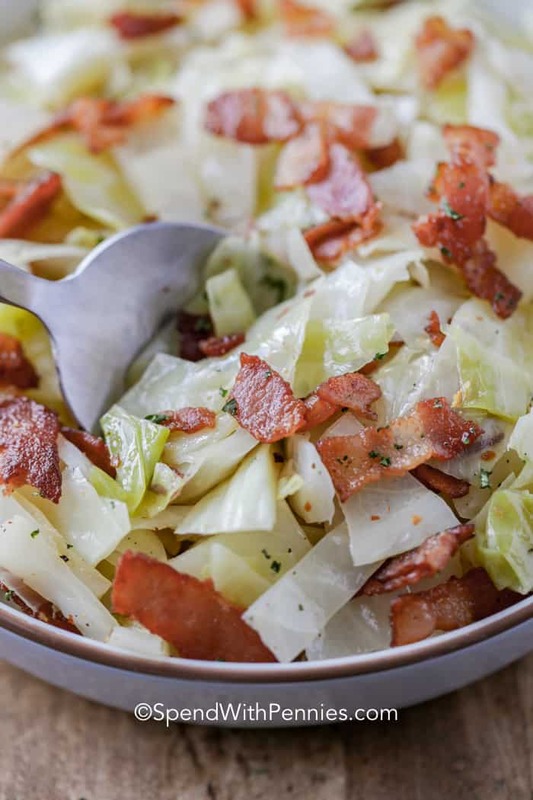 Cabbage becomes sweet and tender and absorbs the delicious smoky salty flavor of the bacon. The result is a simple side dish great for serving with grilled chicken breasts or pork tenderloin! Southern fried cabbage is slow-cooked and simmered in its own juices along with bacon and minced garlic and it goes with other comfort foods like pot roast, meatloaf and polish sausages. You guys know I love any and all things with cabbage from Easy Cabbage Rolls to a healthy Cabbage Soup. Growing up with a Polish grandmother, we always had all kinds of cabbage dishes and now it just reminds me of childhood. Cabbage is so easy to fry. If you cook it low and slow, it will become tender and sweet. Fry bacon until crisp. Remove the cooked bacon but leave the yummy drippings in the pan. Add onion and cook in the bacon drippings until tender (this has max flavor). Finally, stir in the cabbage and cook low and slow about 20 minutes. Season with salt, pepper and chili flakes to taste. Top with the crispy bacon and serve hot. Get creative with flavors and additions and think beyond just fried cabbage and bacon! Add a squeeze of lemon, a sprinkle of parmesan cheese. Fry up chopped green peppers with the onions, add leftover baked ham or capers. The possibilities are endless! Depends on the size of the pan, the amount cabbage you use and what else is in the pan. Cabbage cooks best when it is cooked on medium heat, and how tender you want it is a personal preference. The longer and slower you cook it, the more tender and sweet it will become. To soften it slowly, it takes about 20 minutes. But, a quick stir fry style will take only 10 minutes or so! Experiment and have fun with it. Braised Red Cabbage – colorful and fun! Colcannon Recipe (Cabbage and Potatoes) – classic! Fried cabbage is one of my favorite recipes. 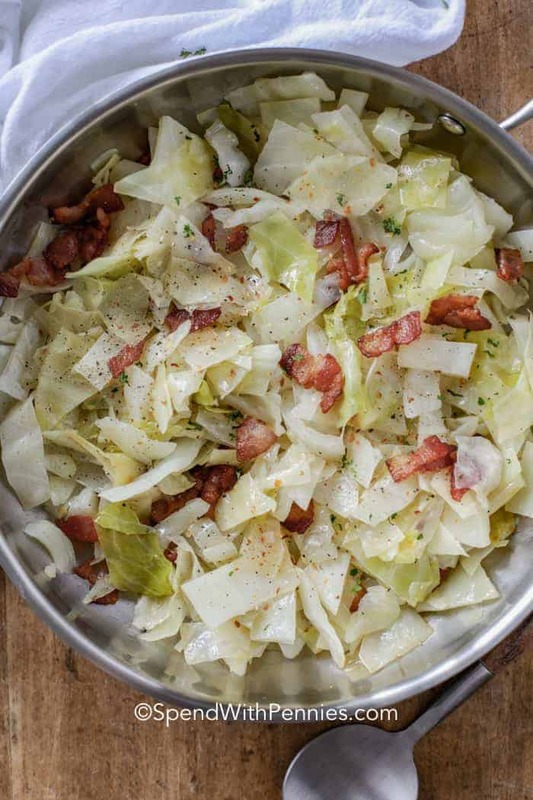 Cabbage absorbs all of the bacon flavor when they’re fried together, creating a deliciously flavorful side dish! Fry bacon over medium heat until crisp. Remove with a slotted spoon and set aside. Add onion to bacon drippings and cook until tender. Stir in cabbage and cook 18-20 minutes or until tender. Season with salt, pepper and chili flakes to taste. Stir in bacon and serve. Favorite Classic Lunch – Homemade Tuna Salad! A classic tuna salad recipe is one of my go-to easy lunches during the warmer summer months. 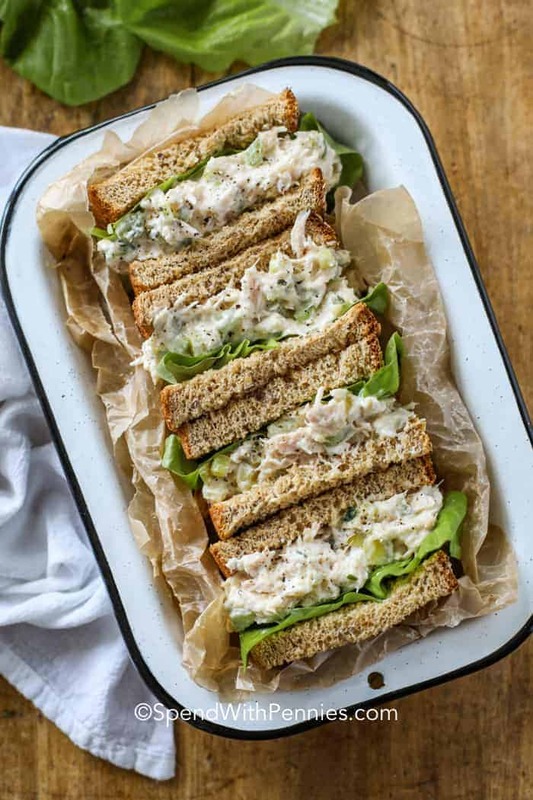 Flaky tuna is mixed with crisp celery, onions, dill pickles, and a creamy mayo dressing. Perfect for tuna salad sandwiches or creamy tuna melts with some coleslaw on the side! 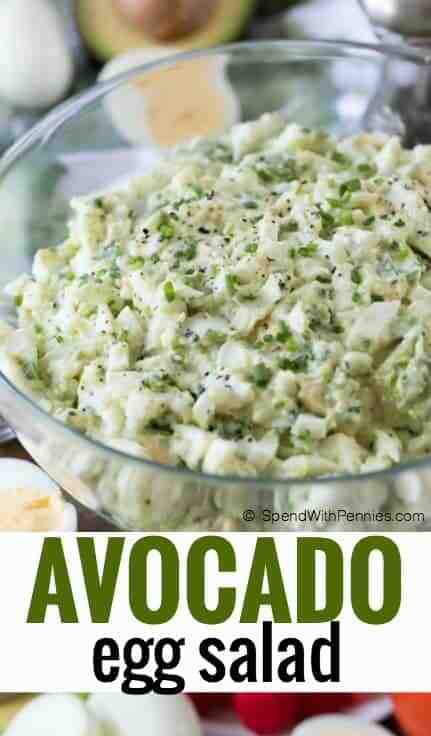 With just a few basic ingredients probably already in the fridge and pantry, you can whip up an salad or sandwiches or even scoop it into half an avocado for a fancy (and low carb) dish! 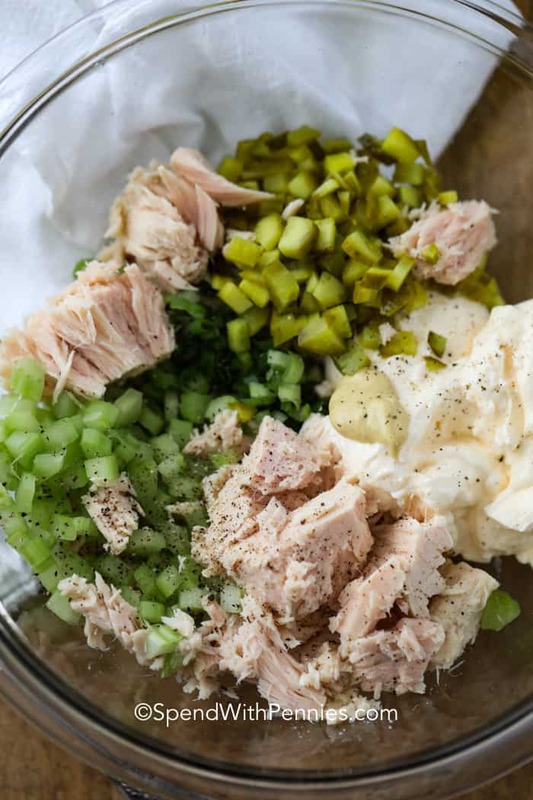 Tuna is a great protein that requires very little prep making it the perfect addition to tuna casseroles, tuna macaroni salads or even just to top a bed of lettuce! Because it’s so easy to make, tuna fish is a great lunch recipe! TUNA: Drain a can of flaked tuna in water. Albacore tuna has the freshest flavor, any brand will do as long as it’s packed in water. Put the tuna into a bowl and use a fork to separate the pieces. ADD INS: Add diced celery, chopped dill pickles, the sliced green onion and mix well. These all add great flavor and crunch, you can add in your own favorite including sweet dill pickles or diced cucumber! DRESSING: Gently fold in the mayonnaise, the Dijon and lemon juice. If you’d like to cut some of the calories, replace some of the mayonnaise with Greek yogurt. Add a little salt and pepper to taste and keep and serve cold! If you’ve got fresh herbs on hand, add them in! Don’t be afraid to add a dash of your favorite spice mix. I like to serve tuna salad sandwiches on whole wheat bread or a darker loaf like rye. It’s also delicious on croissants like shrimp salad! If it doesn’t get eaten up first because it really IS that good, tuna fish salad will keep in the fridge for a few days. Because it has fish and mayonnaise in it, be careful to not leave it out on the counter for too long. Make that tuna fish sandwich and put the tuna salad back in the fridge in an airtight container to keep it as fresh as possible! The best tuna salad is fresh and safe to eat! Tuna salad, tuna pasta salad, even tuna macaroni salad can be frozen, but may need to be drained after it is thawed out. Pasta freezes well, but you made need to correct it with freshly cooked pasta or extra chopped celery and onions to restore the crunch from the celery and pickles. Caprese Salad – one of my favorites! 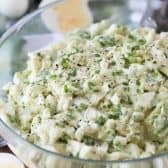 The Best Potato Salad Recipe (Easy) – a classic! This easy tuna salad recipe is one of my go-to easy lunches during the warmer summer months. It’s perfect in tuna salad sandwiches or next to some coleslaw! Use to top a salad, in sandwiches or to add to pasta salads.